The ethos at Abbey Guest House has always been to provide accommodation for as many guests as can reasonably be accommodated. The most recent addition to the range of aids and options available has been the installation of a Ceiling Hoist. This has been installed in the ground floor twin ‘accessible’ room and enables guests to be easily transferred from wheelchair to profiling bed. It can also be used to transfer to the commode/shower chair to access the roll-in wetroom. A new FREE ‘filtered’ chilled water dispenser is now available in the guest breakfast room, it is hoped that everyone will be able to enjoy the health benefits. A range of fruit cordials are also available to flavour the water if required. 2018 Summer started with accommodation being taken by some ‘new’ guests visiting the birdhouse and then some comfortable seating being installed nearby for our more usual guests! There is cosy guest lounge where guests are welcome to sit and relax – with the addition of a welcoming fire when it is cold outside. The whole house is accessible to virtually everyone as a lift (elevator) gives access to the upper floor. There are two family rooms; the smaller one is a triple room, and the larger one is a massive family room that is wheelchair friendly and can cater for 5 or 6. We are a quiet, ‘Home from Home’, non smoking, multi-award winning, highly accessible B&B, in the historic town of Abingdon-on-Thames. Accommodation consists of a choice of 7 en-suite bedrooms includes ground floor ‘Easy Access’ (with wet room), first floor ‘Family Accessible’ (with wet room) and ‘Allergy Friendly’. Guests enjoy private parking (with Blue Badge bay), excellent bus services and local amenities, secure cycle/scooter storage, Fair Trade items and free WiFi. All guests have shower rooms and access to a guest bathroom. Room facilities include: digital Freeview TV & DVD player, free security safe, hair-dryer, towelling robes, digital radio with Bluetooth, USB charging points, iron and ironing board. A host of extra equipment, aids and information is available as we offer a flexible and responsive service for all ages and requirements. 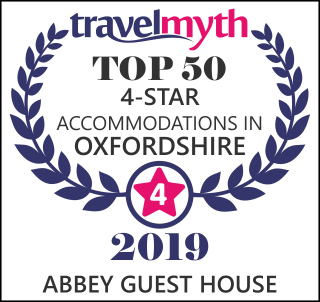 From just outside Abbey Guest House, modern accessible buses provide frequent 20 minute journeys to Oxford town centre, coach and railway stations, with fast onward journeys to London, Birmingham etc. Train services from farthest West Wales or Bristol stop at nearby Didcot Station where buses again link quickly to ‘our’ bus stop outside. Read more about our accessible quality guest house here.